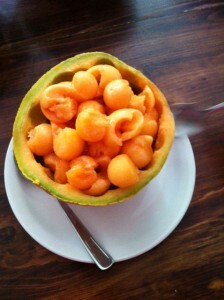 This is one of my all-time favorite summer refreshers, it’s called melon porto. Keep your melons in the refrigerator so they are very cold. Cut in the middle, remove the seeds and ball the inside. Leave the balls in each half. Add a serving or two of ice cold port wine.